The photo doesn't show well how this card was made. I die cut the label design from red patterned paper and a smaller size of the same label from dark green cardstock. I added texture to the small label with a folder. 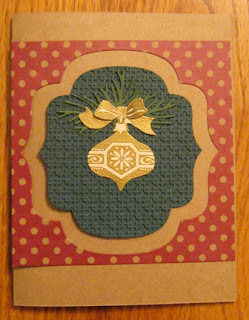 The ornament is a stamp I found in the $1 bin (now a $1.25 bin) which I gold embossed and cut out. I stamped the bow portion twice and added it with foam tape for dimension. The pine is die cut. Is your tree up and decorated? Beautiful cards. Love what you do with dies, punches and embossing folders.